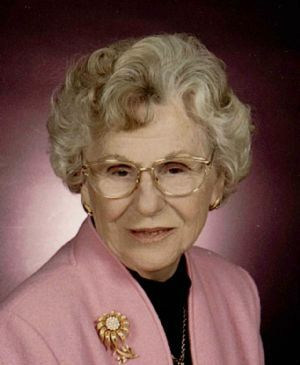 Barbara “Bobby” Rogers, age 100, of Ripon, WI, passed away peacefully on Friday, March 15, 2019 at Prairie Place in Ripon. Barbara was born in Hartford, CT, on November 5, 1918, the daughter of Eugene and Louise (Loveland) Bestor. After Barbara graduated from high school she went on to receive a Bachelor's Degree from Wheaton College, MA. After college she went to work for American Cyanamid Company where she met and later married James Rogers. She was an avid gardener and seamstress. She was known for the beautiful hats she wore whenever she went out. Barbara is survived by her daughter, Linda (Wayne) Bohlken of Scotch Grove, IA; her son, Dr. Barry (Ann) Rogers of Green Lake, WI; seven grandchildren, Christopher (Christie) Speak of Hastings, MN, James Speak of Forest Lake, MN, Rebekah (Sergio) Garcia of Hastings, MN, Cheryl Forbes of Cambellsport, WI, Lisa (Doug) Miller of Dubuque, IA, Dr. William Kirke (Dr. Sarah Wernimont) Rogers of Iowa City, IA, and Virginia (Francis) Pollock of Green Lake, WI; great grandchildren Garrett, Joshua and Anna Speak; Taylor Anderson and Aiden Speak; Clara Garcia; Jessica (Geoffrey) Baumann, Mandy (Vernon) Williams, and Jacob Forbes; Lauren and Kaitlyn Miller; and Alice and Eleanor Rogers; and one great-great grandchild Brandon Baumann. She was preceded in death by her parents Dr. Eugene and Louise Bestor; her husband, James Rogers; her daughter, Berta Louise Speak; her sister Ruth Messenger, and her brother-in-law, Herbert Messenger. A private family Celebration of Life for Barbara will be held at the First Presbyterian Church in Neenah, WI. Inurnment will take place at the Church. Memorials in Barbara's name may be directed to the Federated Church of Green Lake, 489 Scott St., Green Lake, WI, 54941.